Bev Doolittle "The Visual Storyteller"
Bev Doolittle is one of America's most collected artists. Her camouflage art is loved by art collectors around the world. Through sheer force of talent and dedication, she has achieved a status in the art world few contemporary artists even dream of. Crowded with intricate visual detail, haunted by presences seen and unseen, her paintings captivate the viewer on many levels. Bev Doolittle was born and raised in California. As a teenager she won a weekend scholarship to attend the prestigious Art Center College of Design in Los Angeles. She met her husband, Jay, at art school and they started married life with a painting trip to Bryce Canyon and Zion National Parks in Utah. 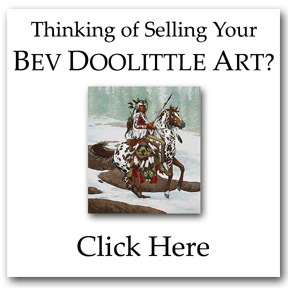 For the next five years the Doolittles were art directors for an advertising agency in Los Angeles. "It paid well, but we didn't like living in the city. We wanted to be close to nature," says Bev. 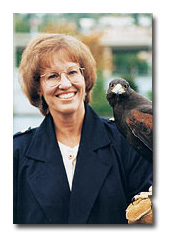 Doolittle's distinctive talent began to fully blossom during a year-long journey she and Jay embarked upon in 1973. Traveling throughout the west in a camper, Bev had the luxury of time to develop her unique style. Her signature painting, "Pintos", proved to be a dramatic departure point for Bev when her evolving style and technique merged with her love of nature to create what would become virtually a new genre. She is often called a "camouflage artist" because her distinctive use of context, design and pattern help viewers discover meanings which seem hidden only until they become obvious. "I use camouflage to slow down the storytelling in a painting. But my messages about our wilderness and native peoples are never hidden." As proof of her dedication to these issues, a portion of the proceeds from sales of Doolittle prints is donated anonymously to environmental and other causes each year. "Earth is beautiful and exciting and I feel blessed that I have been allowed to explore so much of it," says this talented artist.